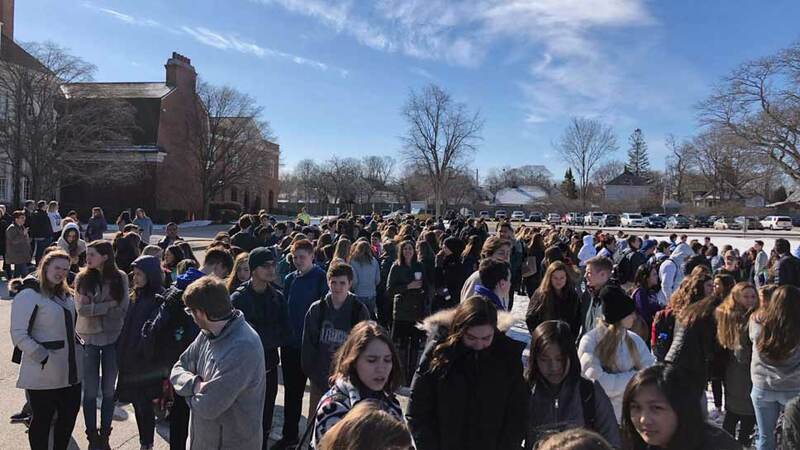 LAKE FOREST/LAKE BLUFF — Approximately 500 students walked out of Lake Forest High School onto its front lawn at 10 a.m. March 14 as part of the National School Walkout, and nine of them kept going to City Hall to vote in the upcoming primary election. Both the walkout on the front lawn and the march to the early voting site at City Hall were organized by local students as part of a national movement started by Women’s March Youth EMPOWER to walk out of school at 10 a.m. local time. The effort came in response to the February 14 shooting where 17 people were gunned down at Marjory Stoneman Douglas High School in Parkland, Florida. Averi Nolan, a junior who began organizing her schoolmates late last month with a social media campaign, said she and others quietly left the building and stood silently on the front lawn of the school for 17 minutes in memory of those killed in Florida. Some students held signs. 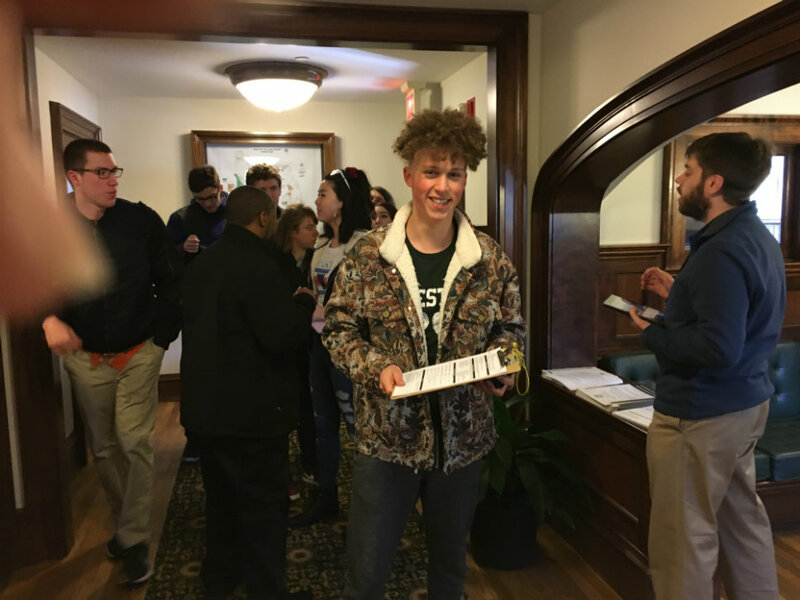 Henry Lunn, a Lake Forest High School senior, registers at City Hall before voting. Elizabeth Porter, a senior and an organizer, said she was happy with the solidarity of the students who assembled on the lawn. She said as she walked out she had a “surreal” feeling watching so many of her schoolmates behind her. “It was a long 17 minutes,” said Porter. “Some people stayed inside because it was too cold to go outside.” Nevertheless she felt they made an impact. “I felt we all understood the issues,” she added referring to gun control in the wake of the Florida shooting. Drew Arnson, another senior who joined his schoolmates on the front lawn, said the events in Florida a month ago have motivated a lot of his classmates to vote. He too will vote for the first time in the upcoming primary. School violence is an issue he said he and others care about. “We have been galvanized to act in our political system,” said Arnson. Students who chose not to participate in the walkout spent the 17 minutes in the commons or the library. Nolan said there was no class between 10 a.m. and 10:45 a.m. as part of the arrangements the school made for the entire student body. Aiden Kinsella, a senior, said he wanted to do more than stand on the front lawn with students. He wanted to make a direct impact on political issues important to him like gun control and send a message to both elected officials and candidates for office. LFHS students on the front lawn — photo taken from inside the school. 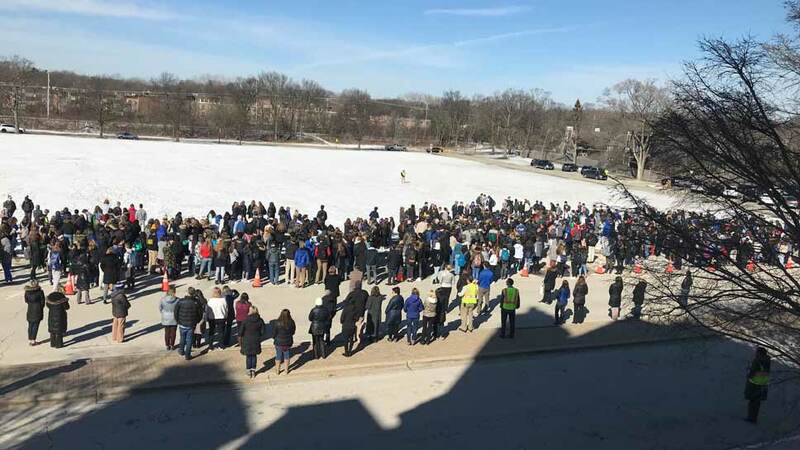 LFHS students on the front lawn during the March 14 walkout. 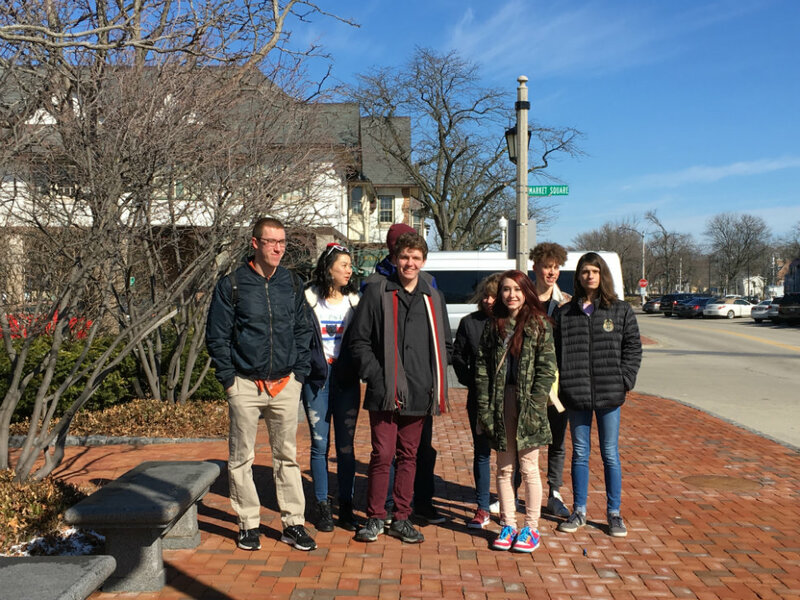 About the time Nolan and Porter started working on the walkout, Kinsella, a senior, organized classmates to walk down the bike path to downtown Lake Forest and City Hall. City Hall is an early voting site for the March 20 primary election. He said more were coming after the 17 minute walkout and still others after school. Of those who voted, three selected Republican ballots and five picked Democratic ones. Their message, however, was the same. Several said they want elected officials and candidates for office to know they expect action from them. 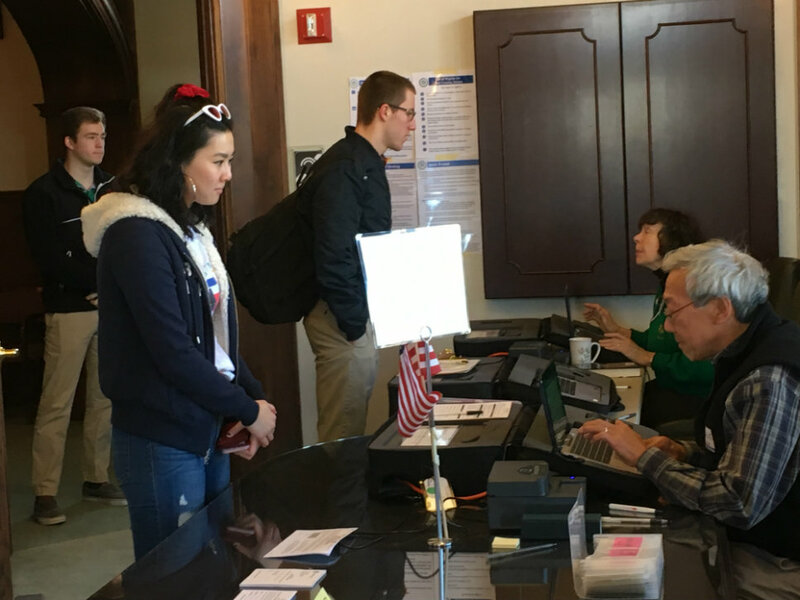 When the students first arrived they were greeted in the first floor lobby of City Hall by two representatives from the office of the Lake County Clerk. Those who were not registered to vote were given the necessary forms to do it on the spot. Those who were registered went upstairs to the polling place. Jenny Davy, an election judge and Lake Bluff resident, saw the teens coming into the room. When she learned they were first time voters she gave them detailed instructions how to properly complete their ballot and place it in the ballot box. The first student to vote was Will Paschke, a senior. Henry Lunn, who registered on the spot before voting, said he did thorough research on everyone on the ballot so he could cast an informed vote. He said he made sure he knew everyone’s views on the issues important to him. Renee Ye, another senior, said Lunn’s detailed research was helpful to other first time voters. 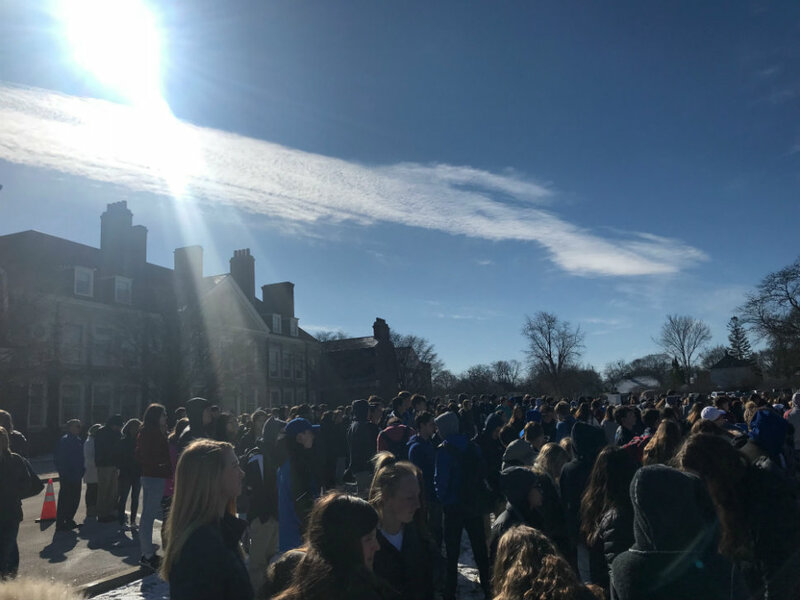 More than 500 students gathered on the lawn in front of Lake Forest High School as part of the National School Walkout. Lake Forest High School seniors Renee Ye (foreground) and Will Paschke get instructions before voting for the first time. Lake Forest High School seniors walked out of school and headed to Lake Forest City Hall to vote.